"Sweet Charlotte's Seventh Mistake is, in fact, one of the more unusual memoirs to come along. Not so much in the subject matter, but in the way that writer and artist Cori Crooks has chosen to present her story about her at-times monstrous mother and Crooks' own efforts to find out which of the two men in her mother's life in late 1968 is her father…What sets Sweet Charlotte's Seventh Mistake apart is its method: a literal collage of images and text, including old snapshots, newspaper clippings, handwritten letters, even the official results of the DNA test. It could have easily seemed like a gimmick, but it's not. For one thing, Crooks' prose often has the economy, even the flow, of poetry so that every scene seems distilled to its essence. entries and handwritten letters on lined notebook paper. Her six older siblings (yes, that makes the author her mother’s seventh mistake) are scattered to live in foster homes or with various birth dads, and her mother fakes cancer twice before actually dying from it. It’s grim stuff, but the scrapbook treatment keeps it from getting too heavy while echoing the spotty, disjointed nature of memory." "Cori Crooks offers a quirky mediation on her mother’s life and the search for her own paternity. Instead of a relating a straightforward narrative, Crooks assembles photos and letters, essays and memorabilia. Through them, she allows readers to glimpse a flawed, fascinating woman who had 15 names, seven husbands and seven children. The identity of Crooks’ biological father, which might seem straightforward, becomes even more subtle and complex." "With a beautiful and intense sense of intimacy Crooks' teenage angst voice tinged with the insecurity of a reminiscing adult takes the reader along for the ride as she shifts through her recollections of preconceived notions and allows us to share her sacred thoughts of the dead, as well as her fears of forgetting and being forgotten This is compassionate voyeurism at its best. As Crooks unflinching exposes every one of her dark secrets for all to share, she searches not only for who her family is, but who she is as well. A truly inspiring and fresh approach to a tough coming of age story and must read for anyone, regardless of age." 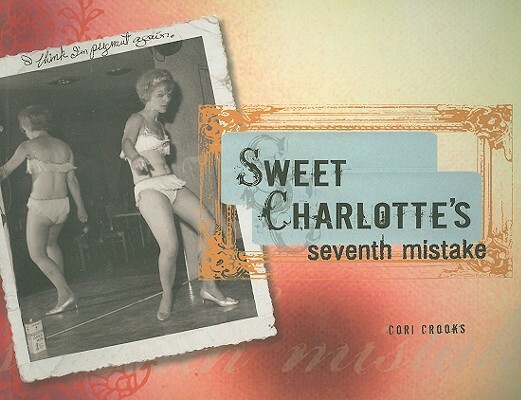 …Sweet Charlotte’s Seventh Mistake, recently published by Seal Press, is far more than just a blog transplanted to the page; it’s a chronicle of family dysfunction that is to memoir what sculpture is to Play-Doh. Crooks has pieced together a pastiche from documents, family photos, poem fragments, letters and her own memory. It’s really the anti-scrapbook,” Crooks says, revealing that the Charlotte” of the title is Crooks’ mother and the seventh mistake” is Crooks herself. And the story is pure pulp fiction.